Tripping Through the Gene Pool: Lets speak "Frankly"
Theuderic III (or Theuderich, Theoderic, or Theodoric; in French, Thierry) (654–691) was the king of Neustria (including Burgundy) on two occasions (673 and 675–691) and king of Austrasia from 679 to his death in 691. Thus, he was the king of all the Franks from 679. 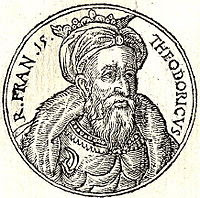 The son of Clovis II and Balthild, he has been described as a puppet — a roi fainéant — of Mayor of the Palace Ebroin, who may have even appointed him without the support of the nobles. He succeeded his brother Clotaire III in Neustria in 673, but Childeric II of Austrasia displaced him soon thereafter until he died in 675 and Theuderic retook his throne. When Dagobert II died in 679, he received Austrasia as well and became king of the whole Frankish realm.